As expected, the Fed announced yesterday it would end its six year money printing and bond buying programme. Given the fragile nature of the U.S. economy, Eurozone economy and indeed the global economy, Fed critics continue to believe that this may be a short term hiatus prior to a resumption of QE, if asset prices start to fall or economic growth falters. Former Federal Reserve Chairman Alan Greenspan admitted yesterday to the Council on Foreign Relations (CFR), that QE and the Fed’s bond buying program, which aimed to lower unemployment and spur stronger economic growth, fell short of its goals. It has been a busy week for the man once known as "Maestro”. The end of last week saw him engage in public discussions with the likes of Marc Faber and Peter Schiff at the New Orleans Investment Conference. Ominously, Greenspan warned at the New Orleans Investment Conference that the Fed’s balance sheet is a “pile of tinder” and gold is a “good place to put money these days” as it will rise “measurably” in the next 5 years. He told the CFR that the bond buying program was ultimately a mixed bag. He said that the purchases of Treasury and mortgage backed securities did help lift asset prices and lower borrowing costs. But it didn’t do much for the real economy. Greenspan, who headed the Federal Reserve from 1987 to 2006 surprised guests in New Orleans when he stated bluntly, "I never said the central bank was Independent!" in response to criticism that the Fed was financing social programmes. This stunning admission, if true, begs the obvious question: to what extent are the current policies of the Fed and other central banks the result of careful reasoning by independent monetary experts and to what extent are they being dictated by politicians desperate for public popularity and reelection or worse still by unelected powerful banks and bankers? Greenspan said that currency debasement had failed to foster economic growth and unemployment had not been alleviated. However, at least asset prices had been boosted which he described as a "terrific success." So Wall Street reaped tremendous benefits from QE while main street flounders and taxpayers, both living and yet to be born, have the privilege of footing the USD 4,000,000,000,000 bill - that is $4 trillion. He also indicated that ending QE would "unleash significant volatility in markets." In what may be the saving grace of his legacy, he continues to expound the virtues of gold. In New Orleans, he was asked why central banks still own gold. His answer was encouraging if a little vague, "Gold has always been accepted without reference to any other guarantee." When asked where the price of gold was headed in the next five years he said "measurably” “higher." He told the CFR that "gold is a good place to put money these days given it's value as a currency outside of the policies conducted by governments." So, the primary policy the Fed has - which is to put a floor under favoured markets and support U.S. bond and asset prices and give the process a complicated sounding title - has failed, according to the ‘Maestro’ who devised said policy. What happens next? We don't know but for once we would be inclined to follow Mr. Greenspan's advice. As we discussed last year, Mr. Greenspan is not the only person to have chaired a major central bank who views gold as a highly relevant strategic asset. The smart money continues to understand the importance of gold as diversification. Marc Faber, who also spoke at the New Orleans Investment conference, summed up our view perfectly when he suggested that each individual should be their own central banker, holding the reserve currency that is gold as insurance against government bungling. Today’s AM fix was USD 1,205.75, EUR 958.09 and GBP 753.59 per ounce. Yesterday’s AM fix was USD 1,228.00, EUR 963.67 and GBP 761.65 per ounce. Gold for Swiss storage or immediate delivery dropped 0.7% to $1,203.22 an ounce in late trading in London. The yellow metal hit $1,201.53 today, its lowest since October 6th. Gold for December delivery slid 1.8 % to $1,202.50 on the Comex in New York. Futures trading volume was 65% above the average for the past 100 days for this time of day, data compiled by Bloomberg show. Silver for immediate delivery slipped 1.5% to $16.60 an ounce in London. Platinum fell 0.7% to $1,251.75 an ounce. Palladium lost 0.9% to $787.50 an ounce, after a five-day bull run. Gold fell on the expected Fed announcement and confirmation that the Fed is to end QE and their highly unorthodox money printing and six year monthly bond purchasing programme. The move was not unexpected by precious metals market participants and therefore the sudden sharp selling raised some eyebrows. Indeed, it has all the hallmarks of continuing manipulation of the gold and silver futures market. If the mooted end of QE is bearish for gold and silver, then it is also equally bearish if not more so for overvalued stock and bond markets. Yet, those markets saw far less volatile trading and saw minor losses - the S&P closed down just 0.14%. The move lower yesterday also took place despite very high global coin and bar demand in recent days which would ordinarily have led to higher prices. It also comes at a time of heightened geopolitical and economic concerns and the emergence of the Ebola virus. Not to mention, the bullish “Save Our Swiss Gold” initiative. 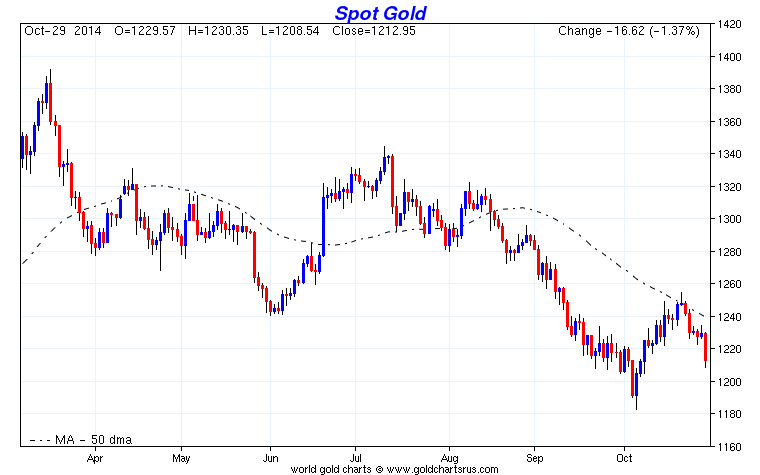 Gold is testing support at $1,200/oz and below that is support at the triple bottom at $1,180/oz.